The dual-SIM (Nano) Oppo A7 runs Android 8.1 Oreo with ColorOS 5.2 on top and features a 6.2-inch HD+ (720×1520 pixels) In-Cell HD+ display. The display panel has a 19:9 aspect ratio, 88.3 percent screen-to-body ratio, and a waterdrop-style notch design. Further, the phone is powered by an octa-core Qualcomm Snapdragon 450 SoC, paired with Adreno 506 GPU and 4GB of RAM. 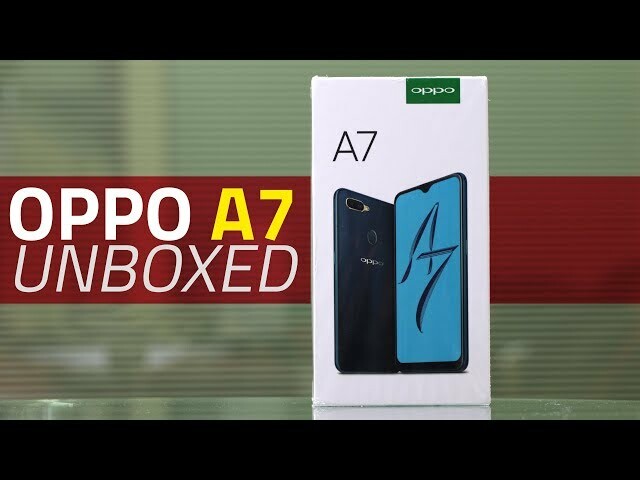 Oppo also notably brought a 3GB RAM variant of the A7 earlier this year. The dual-SIM (Nano) Oppo A5 runs ColorOS 5.1 based on Android 8.1 Oreo and features a 6.2-inch HD+ (720×1520 pixels) FullView display with a 19:9 aspect ratio and an 87.9 percent of screen-to-body ratio. Under the hood, there is a Qualcomm Snapdragon 450 SoC that is clocked at 1.8GHz, coupled with Adreno 506 GPU and 4GB of RAM.